Vegan Keto Dukkah Recipe - Low Carb, & Gluten Free - Super Easy! 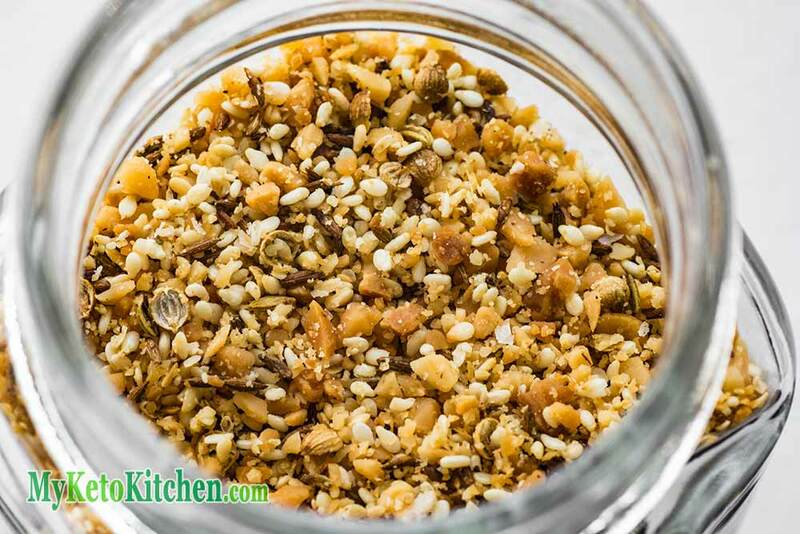 Home » Recipes » Vegan Keto Dukkah Recipe – Low Carb, & Gluten Free – Super Easy! Vegan Keto Dukkah Recipe – Low Carb, & Gluten Free – Super Easy! This vegan keto recipe is a low carb version of Dukkah (or Duqqa). 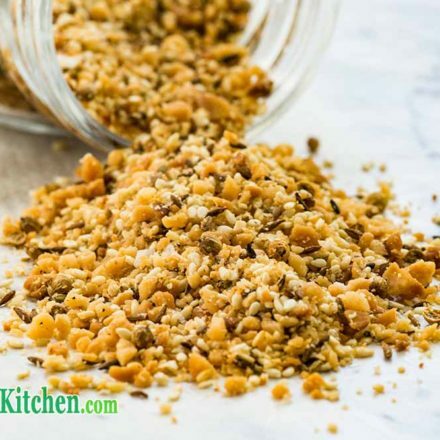 Dukkah is an Egyptian condiment made from nuts, seeds, and spices. This Dukkah is based on macadamia nuts. With the traditional base of sesame seeds, coriander seeds, cumin seeds. Making it a great vegan keto recipe. The dukkah recipe fits right in with a ketogenic diet but its also perfect for vegans and those who are gluten-free. Our keto vegan dukkah recipe makes approximately 250g/9oz in total. We’ve broken the nutritional information down into 10g/0.35oz serves, which is equal to 1 tablespoon. What to do with your new Dukkah recipe is limited only by your imagination. Sometimes a sneaky spoonful straight from the jar is just what you need to fend off hunger. Place macadamia nuts on a lined baking dish and roast for 10 minutes, or until golden brown. Place sesame seeds, coriander seeds, cumin seeds and fennel seeds on a line baking dish and roast for 10-15 minutes, until golden and fragrant. Give the mixture a stir every 5 minutes to prevent burning. Cool the nuts and seeds for 10 minutes. Place macadamia nuts, seeds, salt and pepper into your food processor. Pulse until nuts have broken down into small chunks. Spoon into a dry, airtight jar and store in your pantry. This keto vegan Dukkah is a low carb version of the original Egyptian condiment. It's gluten-free too! 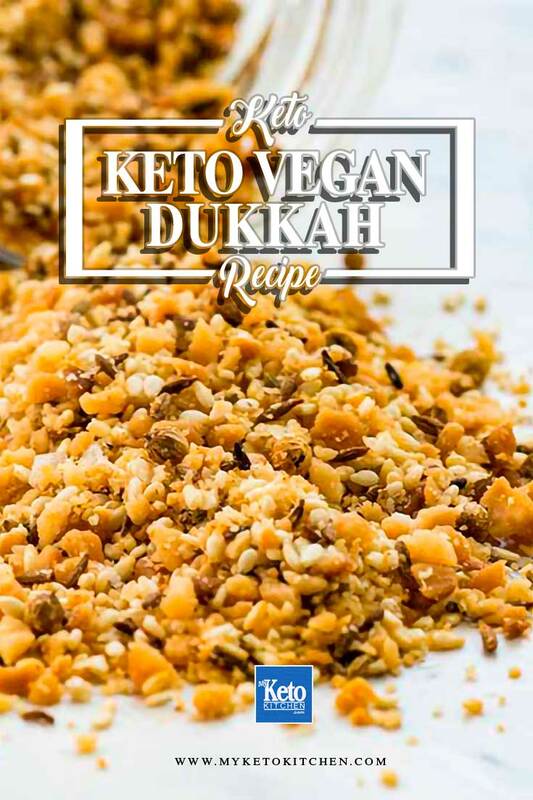 Want to make a larger batch of this keto vegan dukkah recipe the card above. Peanut Butter Mousse – Delicious Low-Carb & Gluten-Free Dessert! Keto Mayonnaise Recipe – Homemade Whole Egg – The Healthiest Mayo Around! Sounds yummy! Would make a great Chri SD tmas gift presented in a small jar!